In Britain the woman’s name Agatha is pronounced ˈæɡəθə, with stress on the first syllable. As far as I know, this is the stress pattern of this name in most kinds of English. In Montserrat, though, I found to my surprise that people stress it on the second syllable. I have never heard the pattern əˈɡæθə anywhere else. Etymologically, the name is of Greek origin. It looks as if it ought to be the feminine form of the adjective ἀγαθός agathós meaning ‘good’, though in Attic Greek the feminine nominative singular is actually ἀγαθή agathē. So it must have passed via Latin to acquire the Latin feminine ending -a. In English it is also subject to the Latin stress rule, which means that since the penultimate vowel is short the stress goes on the first syllable — except in Montserrat. 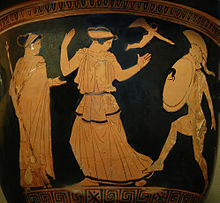 Perhaps the best-known Greek female name is Helen(a). It too has -ē in Greek: Ἑλένη Helénē. Here too, if we don’t thoroughly anglicize it as Helen or Ellen, we have Latinate -a and some uncertainty about the stress. In the name of the island St Helena it is (h)ɪˈliːnə, but as a personal name we usually have ˈhelənə. The latter is what the Latin stress rule produces, given that the vowel in the second syllable is short in Greek. The state capital of Montana, too, is ˈhelənə. As a scientific unit, a “millihelen” is that degree of facial beauty which suffices to launch a single ship (see discussion here). How did the Agathas or their families react to your surprise? Were they themselves surprised at the idea that their pronunciation was unusual and perhaps even peculiar to Montserrat? Or did they feel that it asserted their identity? Aloysiuses in Singapore all seem to be called əˈlɔɪʃəs or əˈlɔɪsɪəs, and are surprisinɡly surprised and dismayed that anyone pronounces æləʊˈɪʃəs. Great link. Even though I knew the millihelen I had not thought of the negative values of it that sink ships and stop clocks. But the rest of the article is a bit of a mix of silliness and sublimity, isn't it? "As a scientific unit, a “millihelen” is that degree of facial beauty which suffices to launch a single ship"
Thank you. That makes my day. Yes John, I just knew you were too well-bred to have elicited the info I asked about, but thought it worth a try, as I had been so uncouth as to make an issue of Aloysius! I might not have done if I had not been so transfixed as to be not quite able to believe there was a whole country where they pronounced it like that. I don't think I would have found əˈɡæθə quite so strikinɡ. It's like the fictional American woman who said she couldn't believe there was a whole country where people said ˈɡʊzbrɪz. I think it was on this blog that I asked once before if anyone remembered where this character appeared, but it still bothers me that I can't place this amusingly iconic quote. One American woman to another in a New Yorker cartoon of yore: "I have to do all the shopping, because my husband won't say 'threepence-ha'penny'. He says it's silly." A question : how would probably have sounded Agatha in Arameic?